* With the Inside Mac Games Emailer, you are able to receive emails from the public, without risking having your email posted on the web site where spammers can snag it for their evil uses. Keep an eye on the products you're interested in with a customizable Watch List. A new section on the homepage lists our latest articles that are related to your Watch List items, and the full Watch List page shows you what's new for each of the items in your list. You can also choose to be notified by email when new articles related to your Watch List items are posted. Find what you're looking for faster with QuickSearch. QuickSearch fields appear in each main section of the homepage, allowing you to quickly find an article in that section. Our full section listings also feature QuickSearch fields, so you can jump directly to what you're looking for without having to look through several pages of listings. Pages load faster and look better when you view the Inside Mac Games websites with no third-party advertisements. This also applies to the Macgamefiles.com website! When a new, popular game file (such as a demo or update) becomes available, avoid the traffic jams and get access to them right away from our private Macgamefiles.com download server for Inside Mac Games Pro users. 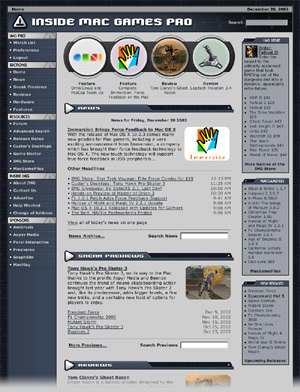 Choose the look of the Inside Mac Games website with a choice of themes. The following themes are available. Save 5 percent on the hottest new Mac games with special subscriber-only discounts at Macgamestore.com! How do I sign-up? I don't see a form for it! Currently new subscriptions with IMG Pro have been put on hold. It will return shortly when a new subscription system is completed. Is Inside Mac Games going to take away features and content from the free version of the site? Absolutely not. We greatly value all of our loyal readers, and we don't think it's fair to cripple the free version of a website to force people to pay for the premium service. Inside Mac Games Pro is strictly a "value-added" service, which adds several new "Pro" features without taking anything away from the free version of the site. Sorry, no. At one time this was allowed, however due to abuse and lack of interest, the free trial period has been discontinued. We feel this page adequately explains all that you get, so you do not really need to try it out before you buy. Check Macgamestore.com for the latest pricing, as it has a habit of changing or offering special limited time offers. Once you pay for a subscription, the account is activated and cannot be cancelled. There is no need to cancel your subscription since you have paid for the year (or years) already. Simply continue to use your subscription until it expires, or don't use it. Can I get a pro-rated refund after I use the account? No. All subscription orders are final.